Recently I was introduced to Jonah Lehrer at the Theatre Communications Group annual conference in Chicago where Mr. Lehrer was a keynote speaker. 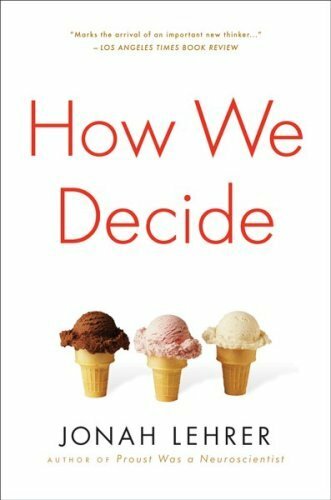 His speech inspired an earlier blog post, and convinced me that I should probably read his book How We Decide. I am just about a quarter of the way through it, and I must admit that I am finding it a bit dense, although completely fascinating. Instead of reading right before going to sleep, I am waking up a little early to read because my brain needs to be fresh to process some of his ideas. 1. If you want to be an expert, you need to fail a lot! Lehrer quotes physicist Niels Bohr who defined an expert as "a person who has made all the mistakes that can be made in a very narrow field." Demonstrating this principle was TD Gammon. TD Gammon was leaps and bounds better than earlier computers at playing backgammon primarily because it was programmed to learn from its mistakes. When TD Gammon was ready to compete, its inventors wanted it to go up against a world class champion so that it could learn, so they recruited Bill Robertie. In describing his first matches with TD Gammon, Bill said "The first time I competed against TD Gammon, I was incredibly impressed. It represented a big improvement over any other computer program I'd ever encountered. But I knew I was still a better player." The next year, when Bill returned to play TD Gammon after a year's worth of almost a million errors in played matches, it was a different story. TD Gammon had become an expert by studying its own mistakes. 2. It isn't good enough to make errors, you must systematically study them. In determining how Bill Robertie could become a world-class expert in three games, it became clear that his success was linked to his systematic study of his failures. Lehrer quotes Robertie who states "It's not the quantity of practice, it's the quality. The most effective way to get better is to focus on your mistakes." In Lehrer's study of Robertie, he noticed that after Robertie plays a game, he painstakingly reviews what happened, and every decision is critiqued and analyzed. Even when he wins, he insists on searching for errors. In my professional life, I have been accused of being a perfectionist more than once, and direct reports have questioned whether I am ever happy with a result as I constantly analyze decisions, even on the cusp of a great victory. From a management perspective, I can see how that could be construed as having an insatiable appetite for perfection, but I guess I view learning in much the same way as Robertie does. Celebrating success is important, but in situations where you need to learn, and learn quickly, you need to focus on the mistakes even in victories. Lehrer concludes that "mistakes aren't things to be discouraged. On the contrary, they should be cultivated and carefully investigated." I believe as managers we are responsible for creating environments where admitting mistakes is encouraged, so that as a team, we can all learn from them. In an age where people only want to talk about "best practices," we should also be discussing "worst practices." As it seems to me that you can only get to the "best" by surviving and learning from the "worst." Recently I was sitting on a funding panel with a representative from a large influential funder, whose organization was supporting projects that could either be great successes or massive failures. It was considered by the funder a "success" to have either outcome, as long as a detailed analysis of each project was made available to the public to learn from. I thought this demonstrated very forward thinking on the funder's behalf, but the funder admitted to me that the public analysis requirement was a significant deterrent to applicants, as they were afraid that public failure would make them less desirable for funding from other sources. As a field, failure should be celebrated, as long as we are relentless in our analysis of each failure and learn from each incident. Shame should be reserved for those organizations who are complacent in situations that demand change.